Dementia affects more than 36 million people worldwide. As a major cause of late-life functional dependence, institutionalization, poor quality of life, and mortality, dementia has posed a tremendous threat to public health and healthcare systems in both high- and middle-income countries. Preventing or postponing the onset of dementia by targeting major modifiable risk factors will significantly reduce the individual and societal burden of the disease. Dementia is a multifactorial disorder, in which the risk of dementia is determined by biological/genetic factors, environmental factors, and their interactions experienced over the lifespan. In the last two decades, a growing body of evidence from multidisciplinary research has suggested that lifestyle and metabolic risk factors (e.g., smoking, excessive alcohol consumption, physical inactivity, obesity, hypertension, diabetes, and hyperlipidemia) are involved in the development and progression of dementia. In particular, from a life course perspective, systematic reviews and meta-analyses of prospective studies have revealed the age-dependent association of dementia with major metabolic factors such as hypertension, obesity, and high cholesterol, i.e., possessing these factors in midlife, but not necessarily in late life, is associated with increased risk of dementia. The biological plausibility for lifestyle or metabolic risk factors to be involved in the pathogenesis and clinical expression of dementia is partly supported by neuroimaging and neuropathological studies. 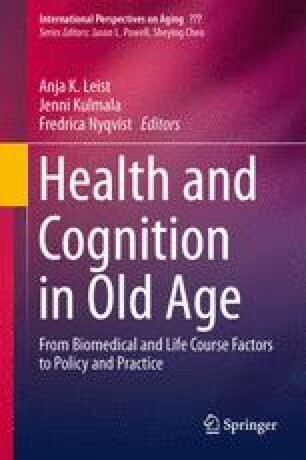 This has significant implications for developing intervention strategies against dementia, i.e., the multifactorial nature of dementia and the proper time-window over the lifespan for intervention should be taken into account in the future when designing preventative programs against this devastating disorder. This work was supported by the European Program Future Leaders of Ageing Research in Europe (FLARE), coordinated by the European Research Area in Ageing (ERA-AGE). Dr. C. Qiu was supported in part by the Swedish Council for Working Life and Social Research (FAS), Swedish Research Council (VR), Swedish Brain Power, and Karolinska Institute, Stockholm, Sweden. I would like to thank Dr. Yajun Liang for providing thoughtful comments on this chapter.